The University of Houston has been burned before when it comes to the politics of college sports realignment. This time, its supporters are lobbying the state's top politicians for some help winning an invitation to the Big 12. The groundswell of support for the University of Houston’s bid to join the Big 12 Conference seemed to come out of nowhere. 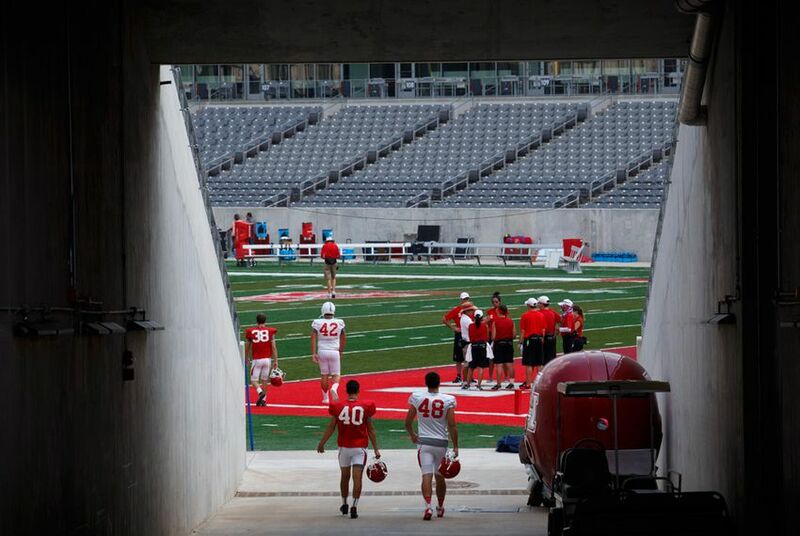 For two decades, the Cougars' major athletic conference dreams seemed hopeless. Then on July 21, Gov. Greg Abbott declared on Twitter that Big 12 expansion was a “non-starter” without UH. Within hours, more state politicians, including Lt. Gov. Dan Patrick, and leaders of other Texas Big 12 schools were voicing their support, too. Suddenly, the idea of UH rejoining the highest possible level of college athletics didn’t seem so far-fetched. The show of support for UH was surprising and impressive. But it didn’t materialize from nothing. The university's most powerful supporters have urged state leaders to back their bid for months. Aware that college sports and politics are inextricably linked in Texas, university boosters have used friendly political allies, face-to-face lobbying and campaign contributions to make their case. It seems to be working. An invitation to join the Big 12 is far from a sure thing — the conference could still choose not to expand or to pass over UH for other teams. But UH is being hyped lately as a leading contender, and it appears to be in its best position for a major conference spot since the 1990s. If that happens, the benefits for the university could be transformative. An invitation would mean a chance to regularly play football on national television and grow the UH brand. And it would probably make the school, which has fought to overcome a reputation as a commuter school, more attractive to many Texas high school graduates. For decades, the university was a part of the Southwest Conference and competed against schools like the University of Texas at Austin, Texas A&M University and the University of Arkansas. But by the middle of the 1990s, the conference was crumbling. Arkansas had already left for the Southeastern Conference, and UT-Austin and A&M were considering joining fellow football powerhouses University of Oklahoma and University of Nebraska in the Big 8. That possibility spelled doom for the SWC. But supporters of two programs, Texas Tech University and Baylor University, fought hard to preserve their place in a major athletic conference. Baylor was particularly vulnerable. On its own, there probably wouldn’t have been many invitations for other major conferences for the smaller private school with little history of football success. But Baylor had one key strength: Political power. Texas’ governor at the time, Ann Richards, and Lt. Gov. Bob Bullock both had Baylor degrees. So did multiple powerful state legislators. And those leaders made it clear that UT-Austin and A&M would face dire consequences if they didn’t take Baylor and Tech with them to their new conference. In 1996, the four teams joined the Big 8 teams to create the Big 12, leaving UH, Rice University, TCU and SMU behind. “It is common knowledge that Baylor made it into the Big 12 because of Ann Richards and Bob Bullock,” said State Rep. Garnet Coleman, D-Houston. UH’s sports teams have languished in relative obscurity ever since, playing in Conference USA and the American Athletic Conference. This time, however, the political landscape is more friendly to UH. The school’s most outspoken supporters in the Texas Legislature may be Democrats, but the governor and lieutenant governor in the Republican-dominated state have lived in Houston and maintain close ties to the city. Two years ago, as Abbott looked poised to become governor, UH PAC officials saw how their luck may be turning. At a political event, Abbott approached Wilson wanting to talk about conference realignment. “He said, ‘It is important that you get into the Big 12, and I am going to do whatever it takes,’” Wilson recalled. A few years earlier, the Big 12 had gone through upheaval. Four teams, including A&M, had left in recent years. Two others — West Virginia and TCU — joined. Despite its name, the Big 12 now had only 10 teams, far fewer than the other major conferences. UH officials saw an opening but had to be careful about openly courting a spot because they didn’t want to anger their current American Athletic Conference. So while administrators worked behind the scenes to build up their sports programs, most of the political push was left to the university’s most powerful supporters. The UH PAC, which is known for aggressively pursuing the university’s interests, has been key. Wilson said the group identified Big 12 membership as one of its top priorities about two years ago. Ever since, its leaders have lobbied more than 50 lawmakers to support their bid. The group has the power of the purse behind it. According to campaign finance records, it has made more than $800,000 worth of political expenditures since 2012. Those include donations totaling $38,500 to Abbott, $32,500 to Patrick and more than $40,000 to state Sen. Kel Seliger, R-Amarillo, chairman of the Senate Higher Education Committee. Perhaps even more important, the UH System’s billionaire board chairman has made his own push. Tilman Fertitta, who owns numerous chain restaurants and casinos, is a powerful figure in the state, having donated hundreds of thousands of dollars to Texas politicians, including more than $350,000 to Abbott and more than $130,000 to Patrick. In October, Fertitta will host a fundraiser for Patrick. A spokesperson for UH said Fertitta was unavailable to comment for this article but pointed to Fertitta's social media postings on the issue. On Twitter, Fertitta applauded the state officials who advocated for UH. "Thanks for not just talking the talk, but walking the walk," he wrote to Abbott. "This is why you are a great leader for Texas." Meanwhile, the university has invested heavily in athletics facilities in recent years, including a new $128 million football stadium and an in-progress $60 million renovation of its basketball arena. In addition, the school has pumped an average of $17 million per year from its academic side to its athletics department since 2012. Millions more have been funneled through student fees designated specifically for athletics. Perhaps even more importantly, the school hired a top-tier football coach. Tom Herman, who was an assistant on a national championship-winning Ohio State University team before coming to Houston, was hired in 2014. Less than a year later, UH doubled his salary to $2.8 million a year. A few weeks after that, UH won the Peach Bowl to cap off a 13-1 season. But even with that success, the school will need to win the support of Big 12 members. The Big 12 announced this summer that it planned to review potential additions. UH was among those expected to be considered, along with Brigham Young University, the University of Central Florida, the University of Cincinnati and others. The university has reached out to leaders of several Big 12 schools outside of Texas. One top target was West Virginia University, whose athletics director until 2014 was Oliver Luck, a former Houston Oilers quarterback who still had strong Houston ties. West Virginia President Gordon Gee toured UH’s athletics facilities when he visited in 2015. Supporters hope that the Big 12 schools will see UH’s improved facilities and athletic success as a good fit. But there are concerns that some Big 12 members may be hesitant to bring in another Texas school. One positive factor has been television. Conferences make most of their money off selling the TV rights to their football games, so expansion is often guided by the goal of bringing in new viewers and markets. UH is in one of the biggest television markets in the country, but many have believed that UT-Austin is so popular in Houston that the Big 12 doesn’t need the Cougars. UH supporters note, however, that only two of the top 10 most-watched football games in the Houston area last year were Big 12 games. UH played in two other top 10 games. The rest were played by Southeastern Conference teams — a galling thought to Longhorn fans who know their rival A&M is now a member of the SEC. In addition, the Big 12’s television contracts with Fox and ESPN reportedly include a clause that would automatically increase its revenue if teams were added. That means the Big 12 schools would probably make more money no matter where the universities they added were located. A decision will likely come in the next few months, with two or four teams added. Or the conference may choose not to expand. Fox and ESPN are reportedly opposed to expansion and could pressure the conference to stay at 10 teams. UH supporters were particularly worried about UT-Austin, which they have long perceived as being the top roadblock to the Big 12. Lately, the two schools’ governing systems have been feuding over the UT System’s plans to build a campus in Houston where its member universities can collaborate and conduct research. So it was a great relief to UH when UT-Austin President Greg Fenves and UT System Chancellor Bill McRaven joined the flurry of people expressing support for the idea of UH in the Big 12 last month. So did Texas Tech University President Lawrence Schovanec. “To some degree, Greg Abbott could have had an impact on that,” Wilson said. If so, it will have made that politicking worthwhile. “The University of Texas is a state agency, as is the University of Houston, so the Legislature has a great role to play in these matters,” he said. UH has spent millions upgrading its athletics facilities and teams to major conference standards. Is it worth it? Texas schools, including UH, are relying more and more on student fees to support their athletics programs. Explore our interactive app detailing how all schools in Texas that play FBS football spend money on athletics. Disclosure: The University of Houston, the University of Texas at Austin, Texas A&M University, Texas Tech University and Southern Methodist University have been financial supporters of The Texas Tribune. A complete list of Tribune donors and sponsors can be viewed here.